Gary Numan appears Wednesday, Dec. 6, at Union Transfer. Gary Numan has never been a guy to looks backwards: Not to the nostalgia of the new wave or early, career-making, electro-pop hits like “Cars.” Instead, the Brit-turned-American (he’ll become a resident in 2018) found and furthered a dark sound based in aggressive industrial tones and rhythms and a lyrical palette that touches on his struggle with depression. 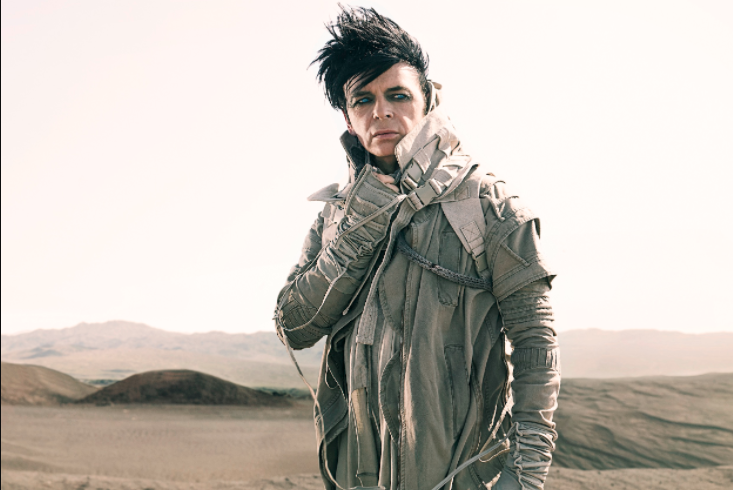 Through that, and albums such as 2013’s “Splinter (Songs from a Broken Mind),” and 2017’s “Savage (Songs from a Broken World),” Numan has come to terms with his hit-making past, his role as sonic avatar, and, even happiness. It hasn’t come easy, however, as “Savage” – his most electronic work since 1978 – was turned away from Billboard’s Electronic Dance charts for not being enough of the latter. During a chat from his home in Los Angeles (in anticipation of his gig tomorrow night at Philly’s Union Transfer), Numan was fighting mad and funny. Q: So far, during your time living in L.A., you’ve recorded “Splinter,” then “Savage.” Do you think there’s been any effect in how you sound or what you write now? A: I don’t believe that it’s made any difference. I really don’t. There’s a little corner of my brain that is forever dark. It all comes from there. It doesn’t matter if I live in a desert or a rainforest or the Arctic. I think I’d make the same music. I don’t seem to be affected by environment, but rather my fears and uncertainties. A cautious emotion drives me…Well, to make any music in the first place, colors all my subjects. I actually started “Splinter” in England under some particular[ly] miserable weather, with the whole of “Savage” done in California, but you’d be hard-pressed to hear any difference. It’s just that dark corner of my brain that drives it all. Q: OK, so that dark corner of your brain doesn’t have a zip code. How have your fears and anxieties changed? A: (Laughs) “Splinter” and “Savage” are two different animals. The first came along as I was pulling myself out of this three-four year period of depression. Before that, my wife had her own bout with depression. So, that, collectively, as a team, we were in quite a bad way for a time – quite a state, really, so, “Splinter” was like my homemade therapy to all that. Writing about it, describing it, helped me to understand it – the feelings behind it. The abstraction of it was very useful, a key component in healing. I think we came out of that stronger than before, less volatile, less moody. “Savage” is still fueled by all that, and disappointments to be sure, but, this album looks into the future more – nothing to do with me, but rather the dangers I see for my children. I have great anxiety for them. Q: “Savage” is your most electronic album since your start. Why do you think that is? A: Since ever (laughs). Yeah, the funny thing with that is, compared to what are considered my early classics such as “The Pleasure Principle,” the percentage of electronic to organic is much greater here than any of my first records, considerably. Like 93%. I went into this new album with it unfolding as it wished. I had no direction in terms of style when I went into “Savage,” other than I wanted it to be reasonably heavy. There’s some Middle Eastern influence – quite filmic, I think. Not dance-y or groove-oriented or rocky. I just sat at my piano and saw what came out, and what came out was an emphasis on electronic, which is all the more strange considering that Billboard decided to not chart it. Q: That was my next topic. You helped invent that category, yet, Billboard won’t consider you because “Savage” is not pop-dance enough. A: Me? Of all of people? It was bizarre. It’s one man at Billboard who is in charge of this. I was informed that they weren’t going to let me in the chart by wife after my label had asked me how electronic this all was. Which was a strange question to me. My label didn’t want to upset me with the Billboard news, especially after they refused to hear anything more from us. Apparently they didn’t think it was electronic sounding enough. That was that. It’s their magazine, and they can do what they want, but I’m supposed to be a legendary pioneer of electronic music. It was the weirdest thing. I guess I’m no longer the electronic guy. Q: You didn’t always have the friendliest relationship with your past, or rather, your hits. Now, it sounds as if your feelings about your old songs have changed. How did that happen? A: I did this thing with Trent Reznor in 2009 – a guest spot in London – and I’m waiting to go on. Mind you, I have huge amounts of respect for him. I hear Trent talking about how I am this huge influential genius to him, and how important I was to his development of Nine Inch Nails. Absolutely blew me away. That was a pivotal moment for me. If someone like that could feel so positively – had that strong a feeling – then how childish was I to pooh-pooh all that I had done in the past. Maybe I shouldn’t distance myself from the early material. Now, I don’t want to spend my entire career looking backward – never have, never will – but now, I can be proud of my past. I was so busy running away from that, having that early material be a cloud over my head, that I became a childish, little boy. Time to grow up, then. Gary Numan appears Wednesday, Dec. 6 at Union Transfer, 1026 Spring Garden St. Show time is 8:30 p.m. Tickets are $30.